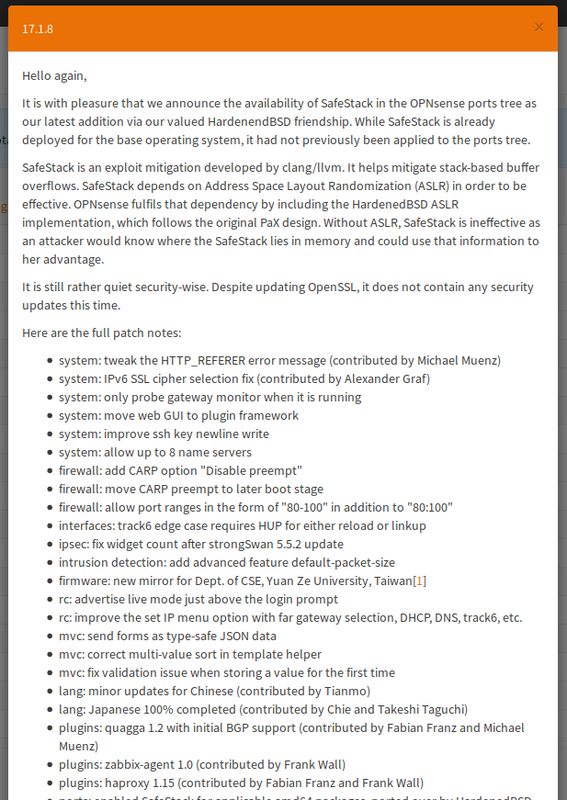 Nice to see a fair comparison that wasnt sponsored by Netgate operatives to smear OPNsense. I can say my own personal experience as a service provider, is that the OPNSense folks were fair and willing to work with us to include authentication support for our web filtering services. Took me a while to approve your comment, sorry for that. It was among those deemed spam by WP. Well, I’m pretty happy with OPNsense, too. I’ll try out pfSense when they release version 2.4, but I don’t expect them to grow any killer features (even though root-on-ZFS is really nice) that make me switch back. From what I can say so far the OPNsense community is great and the devs are really approachable, too. Honestly, I wanted to get a fair comparison feature wise of the two and literally the first comparison (the main dashboard) is *at best* disingenuous. Which really just made me stop there. In fact, my pfSense Dash looks much more like the OPN dash, but a nice dark color. I agree the sub-menus are nicer (from your screen shots) but I won’t even finish the article now. I didn’t promise a feature comparison. From my understanding they are still quite similar in that regard even though the code diverged a lot. Of course such a comparison would be nice, but I didn’t find anything like that on the net and decided to write this post and cover what I can cover. A lot of this is probably obsoleted now with pfSense’s 2.4 realease, anyways. Feel free to write a feature comparison. I’ll be sure to read it! 1. It installs ALL available packages taking up a larger disk space. pfSense on the other hand requires a minimal installation and allows you to choose which packages to add. 2. 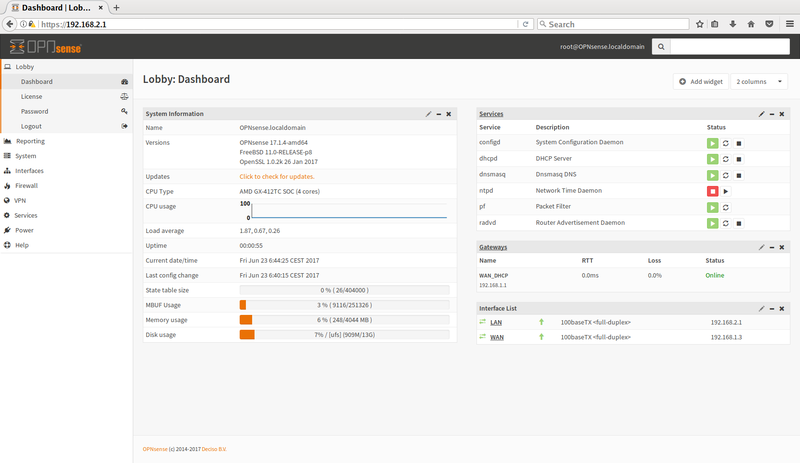 Squid and SquidGuard implementation (most useful packages for me) is much poorer in OPNsense when compared to pfSense. This was a real deal-breaker which is why I uninstalled it. Haven’t done anything with Squid so far. So thanks for sharing your experience. For me the new pfSense version is also appealing as it has dropped the DragonFly installer and it supports installing root on ZFS. We’ll see what happens in this regard in OPNsense land. Competition is good. Thanks for this article. Now that pfSense is forcing community edition to upgrade hardware to support AES-NI I will be giving OPNsense a try. I only every have one VPN session connected at once so software VPN is plenty adequate for me. I feel pfSense’s decision to require this for the community version was a bad one. I much rather try OPNsense than shell out an extra $400-1000 for new hardware. Hi Yazif! Glad that you liked the article. There have been some good things with pfSense and some bad ones. The best new feature for me is full ZFS support (which won’t even be in the next OPNsense version due this month…). However I’m not totally sure what to think of Netgate and what they might plan for the future. This and things like support for LibreSSL made me stick with OPNsense after trying it out. I also found the community to be really friendly and am pretty happy in general. Actually I had not even noticed that the new version of pfSense requires AES-NI support! Thanks for pointing this out. Well, looks like Netgate would like to sell some of their hardware with pfSense pre-installed. 😉 I totally agree with you that it’s simply not necessary to make this processor feature mandatory. A use case like the one that you mentioned should be perfectly fine without acceleration, after all. Just a quick note: I’ve been one hell of a pfsense guy for many many years. I just upgraded my box and obviously installed pfsense. But guess what, panics, crashes etc. So i decided to give opnsense a try, wasn’t in the mood for deep debugging. Surprise! No crashes, no panics, everything just works. 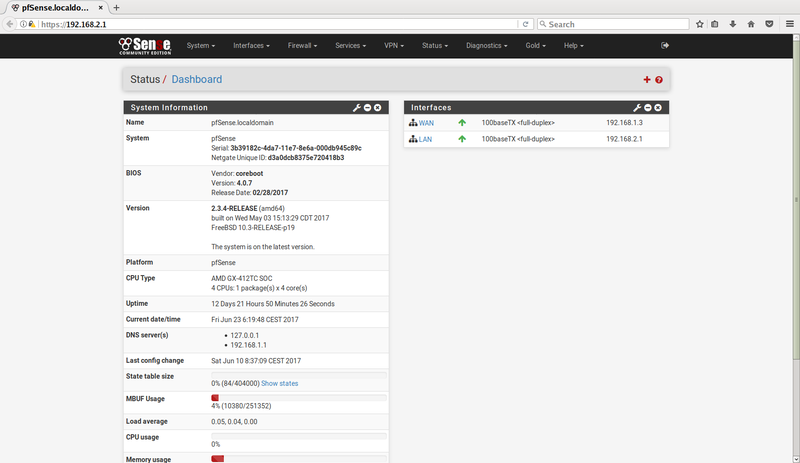 Not to mention some really nice features i missed on pfsense, like 2FA and out-of-the-box suricata. I thought I was the only one having instability issues with pfSense 2.4. I admit, with as much configs and tinkering, I should have wiped and config’d from scratch but the last nail in the coffin was when I changed some QoS settings and got a kernel panic. Had to quickly take pfSense of out line, re-route some cables, and plug straight into the switch. I’m messing with Sophos right now and it’s light, clean, very responsive. I miss pfBlockerng and the ability to filter by ASN. I’ll give OPNsense a try. Another thing that could sway people to use OPNSense is the fact that (since V. 2.4 ?) pfSense is not supporting i386 anymore. I know it’s not a big deal for most, especially power-users, but it’s nice to be able to keep some old HW in use. I built myself a starter-FW with a cheap used HP Thinclient (32-bit Atom) from eBay and a used dual-Eth NIC. You could also just install plain OpenBSD and be done with it. I’m about to try opnsense now, pfsense is a nightmare to work with and i’m tired of the attitude from those who know it’s super secret inter workings. Haven’t used pfSense in about two years now. I was tempted to try it out again for the love of ZFS, but now OPNsense supports that, too (even though not in the installer, yet). Have things really become that bad? But with the attitude of some pfSense guys – yeah, that’s really a problem. A hard one to fix, though. The OPNsense people are nice and approachable, though. What a contrast! I just had pfSense go into a loop where it crashes on startup and keeps rebooting, so I tried OPNSense and honestly prefer it by a ton. I even contributed to pfSense’s GitHub and went through the web UI, agreed, the code is garbage lol… I’ll be sticking with OPNSense for a while though.